i'd be down to help you build that cab! ha! Awesome drawings! 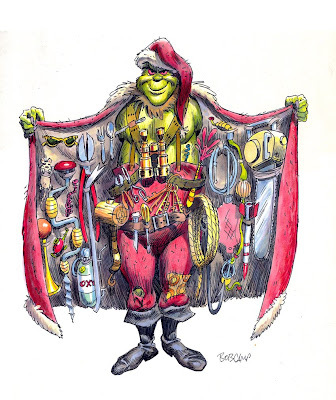 Grinch's boots have a cool Jack Davis vibe. Thanks smo. Yeah let's do it! Yeah the Davis thing was intentional. Yeah, but in NYC you'd need a taxi medallion to be a legal cab in the city. This allows a set number of cabs to be on the streets making up traffic, I can't think of the exact number now though. Did you ever meet Jim Carry? Hey Brandon, it was just a fantasy. Yeah I did meet Jim. He was really funny. I was pitching a storyboard to everybody and I suddenly realized somebody was breathing down my neck and I looked back and Jim was standing right next to me leering down (he's quite tall) at me with a creepy grin. I nervously looked around and everybody was grinning at me and somebody said "I think the big guy likes you Bob". It's something to see that face a half inch away when you are used to seeing it on the big screen. He was very nice and told me he was a fan of my work. Oh I think you'd pick up a hell of a lot of fares. Fun drawings! The items the Grinch keeps in his Santa coat are quite disturbing, but I do think you could make some nice cash with that awesome taxi. I love that first drawing. 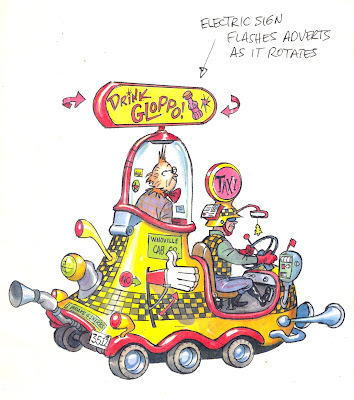 I love the Jack Davis vibe. By the way, is the Grinch packing heat? Man those are really great. I dig them a bunch! Hey I remember these!! I loved these when I saw them back then! especially the cab. we gotta get somebody to build one of those and get a medallion.